Our Stud Dogs have proven themselves for temperament, desire, marking ability, and the ability to reproduce themselves in their offspring. Our Stud Dogs will add value to your next litter. Take a look at them, their accomplishments, their pedigrees, and the quality of puppies they produce. We require a negative brucellosis test taken within the last 15 days before breeding. 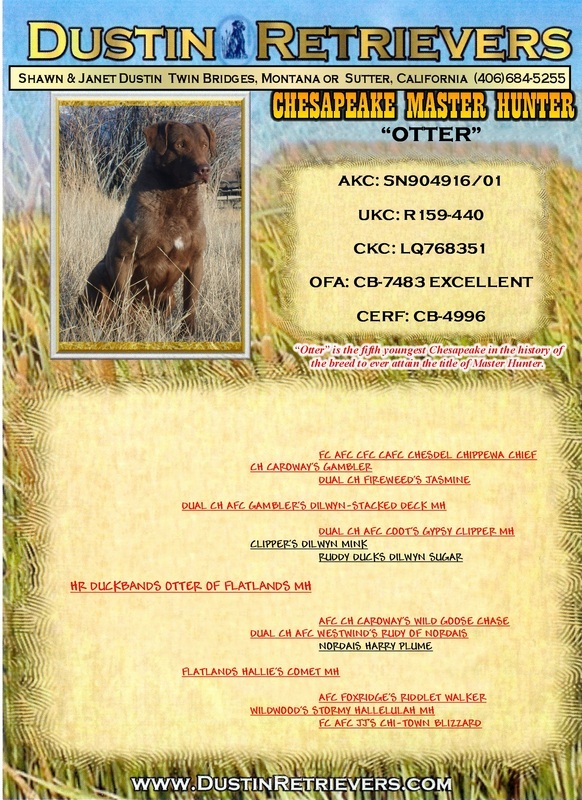 “Otter” is a titled Master Hunter Chesapeake Bay Retriever. 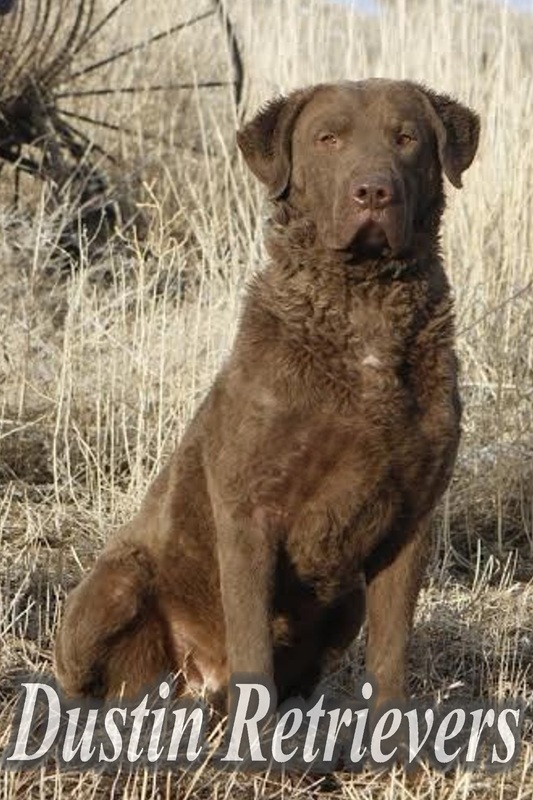 “Otter” is the fifth youngest Chesapeake in the history of the breed to ever attain the title of Master Hunter. “Otter” is the youngest dog in the last five years! His mother is the second youngest of all time. 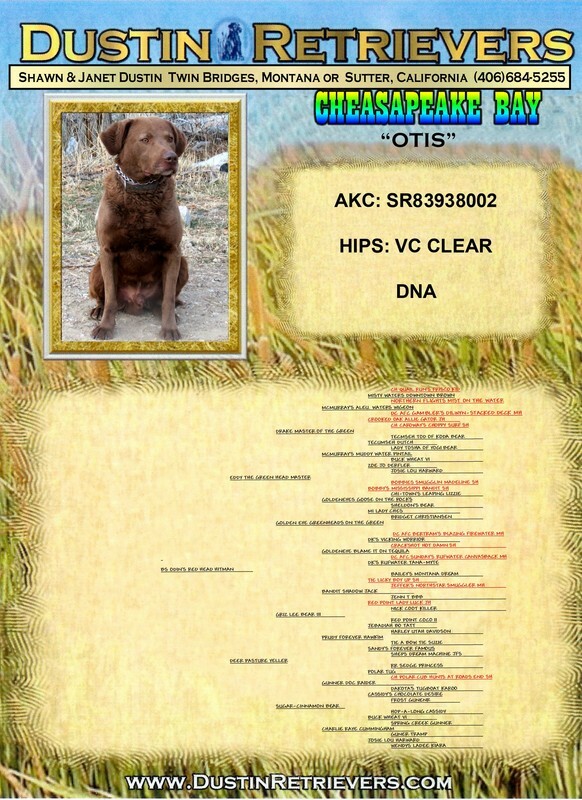 “Otters” pedigree is outstanding and is the who’s who in the Chesapeake breed. “Otter” is very good looking and has an excellent temperament with tons of desire and style. His personality and confidence and the ease at which he is trained make him a joy to be around. “Otter” is truly a “once in a lifetime dog”. As well as being registered with the American Kennel Club (AKC), “Otter” is also registered with the United Kennel Club (UKC), and the Canadian Kennel Club (CKC). “Otter” will add substantial value to your next litter. "Oak" is a wonderful, hard working companion. He loves to retrieve in any terrain, the harsher the better and in the the water, icy or not. He has an excellent temperament with all people, and other dogs, and especially good with children. He is confident, has a GREAT personality and is stunningly handsome! His puppies tend to have beautiful coats with a nice wave on them. He has a gorgeous solid coat, but , depending on who he is bred to has the potential of throwing multiple shades of light deadgrass to dark brown. 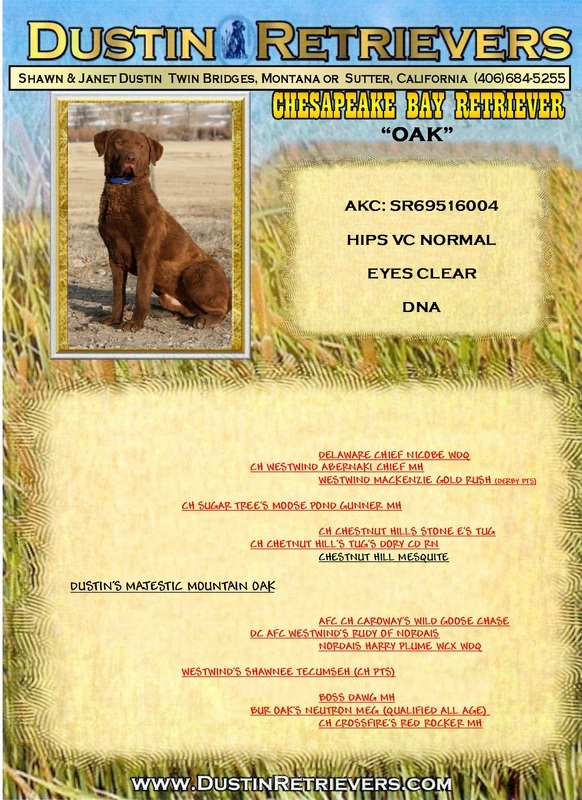 He is a very classic looking Chesapeake with a happy nature about him. "Otis" is a Family Hunting Companion. He has a very level personality. Loves to please, always happy to be with us no matter what we are doing. He has an excellent temperament with all people, and other dogs, and especially good with children. He is confident, upbeat, happy, and loves to retrieve and work. His puppies are VERY NICE, they tend to have a great temperament and are absolutely beautiful!